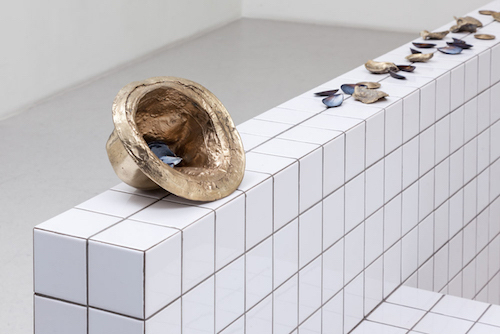 Athanasios Argianas, Silence Breakers Silence Shapers (Aberrations on Percussion) Series, Wall, 2015, electroformed copper, electroformed brass-plated copper, mussel shells, cast bronze, ceramic tiles, fired ceramic, laser-etched finger cymbals, 37“ x 13' x 39”. In Athanasios Argianas’s Silence Breakers Silence Shapers (Aberrations on Percussion) Series, Wall, 2015, two L-shaped tiled benches are built into the sides of a long white ledge with dark, sandy grouting—the kind of bench you might find at a public bathhouse or along the Mediterranean coastline. Offsetting the anonymity of the clinical white grid are iridescent mussel shells splayed open, shucked, cleaned, and sprinkled across the tiled surface alongside more weighty, scraggy oysters cast in brass. Also included are a series of finger cymbals with engraved poetic directives such as “Scrape the ground with this disc, make a sound with your wrist.” Reading the words on these small instruments delivers a fleeting moment of auditory synesthesia: the imagined sound of metal clacking across the ceramic surface or clawing along the linoleum floor. On one end of the bench a woven straw sun hat cast in copper is perched upright, with creases and folds from use, as if frozen in time. On the other end is an upturned bronze Panama hat filled with even more mussel shells, as if the ghost of Marcel Broodthaers had already come and gone. Harmonious sculptures from the 2015 series “Consonants as Noise,” made of curved brass piping pinned to the walls in mirrored variations, are displayed in the next room. The pipes are muted in stillness, resembling partial silhouettes of wind instruments held afloat. Each austere pairing hosts the unsung whispers of a unique mollusk, whose projected callings come full circle in the sculpture Clock Sequencer 1, 2012, mounted on the facing wall, where glasses of water perched around a steel ellipse evoke their longing to return to the sonorous motion of the sea.